Candidate Trump speaks out against the Iran deal during a tea party rally in D.C. on September 9, 2015. Two years ago, when President Obama and his five global partners negotiated a deal that lifted some economic sanctions on Iran in exchange for a verified freeze and rollback of its nuclear weapons program, there was every reason to believe that the deal was permanent. When its congressional opponents concluded that they couldn’t muster the votes to kill it, they settled for a requirement that the White House recertify every three months that Iran is keeping to the deal’s terms. For a Democratic president and a Republican Congress, this was supposed to be the foreign-policy equivalent of the endless House votes to repeal Obamacare — a free spot for political posturing with no actual implications. A number of skeptics, from current Secretary of Defense James Mattis to GOP senators Rand Paul and Bob Corker, came around to the idea that they were better off with the deal than without it. Why? Mattis put it succinctly: If he had to go to war with Iran, he would very much prefer that they not have nuclear weapons. Even then-candidate Donald Trump seemed to buy into this approach. Trump frequently said the Iran deal was “terrible,” and that he could negotiate something better — but was noticeably slower than his GOP rivals to promise to tear it up. Oh, what a difference a year makes. 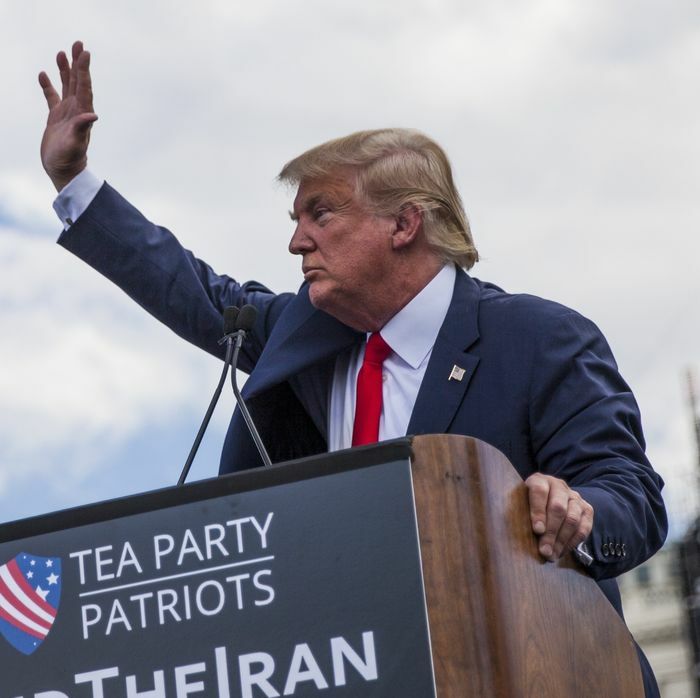 It has been reported that Trump is angry about Iran’s support for terrorist groups elsewhere in the Middle East and its continuing development of threatening conventional weapons. The president is also said to be annoyed at the unanimity among his Cabinet members that the agreement should stay in place. Whichever it is, although his administration has presented no evidence that Iran is violating the terms of the deal, it seems he intends to “decertify” the agreement in a speech next week. But wait, does that mean Trump is launching a full push to reimpose the level of sanctions that crippled Iran’s economy before the agreement? Uh, no. In a maneuver that is beginning to look familiar — see the recent battles over health care, Dreamers, and transgender military service — Trump seems to want to be able to declare that the deal is bad while someone else takes responsibility for changing it. This approach lets Trump tell his base that he’s taken strong action against a foe, while Congress determines what the move actually is — and what its effects are. It’s easy to dismiss this as another rhetorical sleight of hand — Trump gonna Trump — and it is tempting to both advocates and critics of the deal to minimize this decision. But it turns out words matter in international relations. This playing with rhetoric is going to have three real-life effects, starting right now. First, it makes life easier for Iranian hardliners, and more difficult for Iranians who have argued — against hostility and threats — that their country should stick to the deal. Iran experts believe that increased sanctions and hostile rhetoric from Washington will eventually goad hardliners in the Iranian government into breaking the deal and returning to nuclear-weapons development. Of course, that’s exactly what everyone on both sides of the debate claims to want to avoid. Opponents of the deal believe that Tehran can be pressured into making more concessions — both on its nuclear activities and in other areas, like its support for extremist groups — without pushing it out of the deal, by a combination of increased U.S. sanctions and inflammatory talk. But even if that were true, it would require a careful and well-executed strategy to push Tehran just hard enough. That’s hard for the Trump administration to execute with most of its senior slots for diplomats and Iran experts empty, and its chief diplomat, to put it mildly, compromised. The second concrete outcome Trump’s actions have already had? Further alienating the group of countries that are our co-signers on the Iran deal: our closest European allies, plus Russia and China. All have made it clear to the president, Congress, and anyone who will listen that they believe the Iran deal is working and want it to stay just as it is. The president has resolutely ignored them, humiliating embattled U.K. prime minister Theresa May by responding to her arguments with “you make your decisions; I’ll make mine,” and telling her he’d made a plan but wouldn’t share it. But so what? America First, right? Not when it comes to affecting Iran’s behavior. You want Iran to stop building long-distance missiles, propping up Syrian dictator Bashar al-Assad, and shipping weapons to Israel’s foe Hezbollah? You need their partner-in-crime Russia to change its strategy. You want to choke off Iran’s international oil sales? You need Europe and China. Now, instead of working with Washington to strengthen pressure on Tehran, those governments are all over Capitol Hill asking members of Congress to keep the deal in place. When is the last time European allies made a public effort to influence our Congress to oppose the foreign-policy preferences of a president? Pretty much never. The third real-time effect is on that little matter of North Korea and its nuclear saber-rattling. Remember them? Unlike Tehran, they have nuclear weapons and a regime that has threatened to use them against us. For any kind of negotiations with North Korea over its nuclear program to work, Pyongyang must believe that Washington will keep its word. So must China, which will have to bring Kim Jong-un to the table. Watching Washington ignore its allies and tear up a complex agreement that took two years to negotiate will make it harder, not easier, to align China, South Korea, Japan, and others to pressure the North effectively. Secretary Mattis, and all of Trump’s cabinet, have made it clear that they’d rather negotiate than fight, and they’d rather take on countries without nuclear weapons. Even if Trump’s threat to decertify turns out to be a giant head fake, his rhetoric has made those two very sensible, non-partisan security goals much harder.